Everyone needs a place to store tools, cleaning supplies, and whatever else you might need in a pinch! This tote is a great solution to that problem! Stock it with cleaners and rags or stock with a few screw drivers and hammers! Place it under the sink or in a closet so when you need it, it's right there! 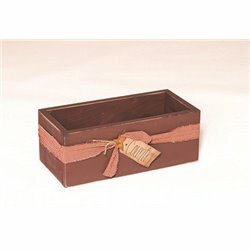 It can also be used as an accent piece to hold remote controls, magazines, & hobby items! This uses for this tote are only limited by your imagination! Available in your choice of 6 paints or 2 stains!